Ammophila breviligulata.Ammophila breviligulata. By Glen Mittelhauser. Copyright © 2015 Glen Mittelhauser.New England Wild Flower Society.gobotany.newenglandwild.org (Accessed 4/2015). Ammophila breviligulata is a perennial C3 grass (Waller and Lewis 1979), 0.5-1 m tall; colonial from a long, creeping rhizome, habit stiff, coarse. Leaves alternate, sheath smooth, ligules membranous, 0.1-0.3 cm long, blade elongate, 0.4-0.8 cm wide, thick, rough textured above, inrolled. Flowers dry, papery, spikelets 1-flowered, glumes papery, almost equal, 1-1.5 cm, lemma shorter, hairy at base; inflorescence erect, dense, cylindrical, 10-40 cm long, 1-2.5 cm wide, pale tan, base often enclosed in upper leaf sheath; blooming and fruiting July-Sept.
Fruit dry, 1-seeded, grain, about 0.3 cm long. Seeds eaten by some birds, particularly sparrows (Martin et al. 1951; USFWS 2005). 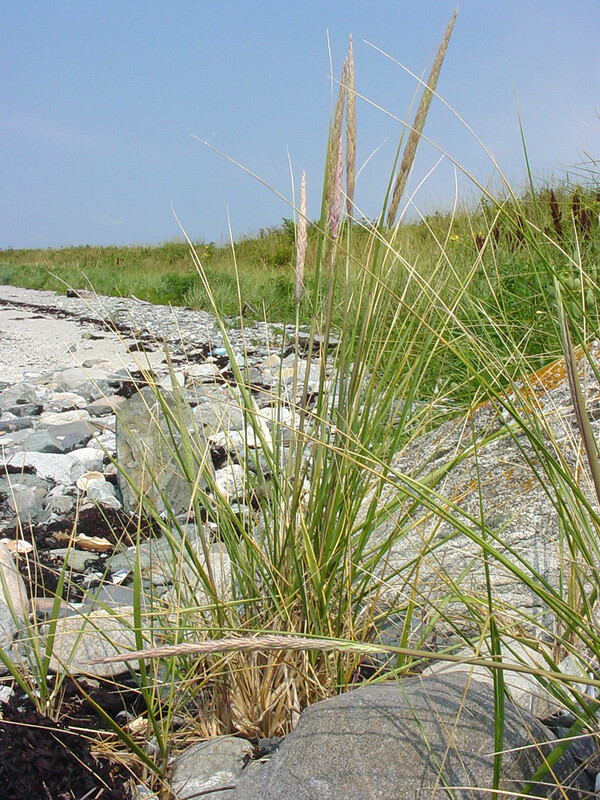 Habitat: Coastal dunes and beaches above high tide line; soil pH 5.8-7.8; tolerant of salt, moderately tolerant of drought and fire, intolerant of shade (USDA, NRCS 2006). Notes: Tolerates burial in sand, roots associated with arbuscular mycorrhizal fungi (Glomus sp., Acaulospora sp.) helps protect against attack by soil nematodes (Little and Maun 1996). Important for dune stabilization. Populations may be limited by drought, pathogenic nematodes and storm events that set back succession (Day et al. 2001).